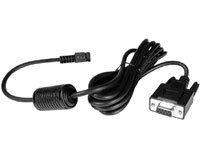 Garmin PC Interface Cable (RS232 serial port connector) (010-10206-00) €43.00 - buy online at mysatnav.ie - Ireland's leading GPS & Sat Nav store. This cable allows you to connect your GPS to your PC so that you can create routes and waypoints on you PC and transfer them to your GPS. You can also download map detail from MapSource CD-ROMs to compatible units. Cable features a standard RS232 serial 9-pin D connector and a moulded Garmin plug to connect to your GPS.